First off I want to start out by saying I really did not educate myself or research the pros and cons of heart rate training plans or even how to properly engage in one. As you probably know I like trying new things out and once I knew my Garmin 235 could do wrist based heart rate I thought it may be cool to try it out. 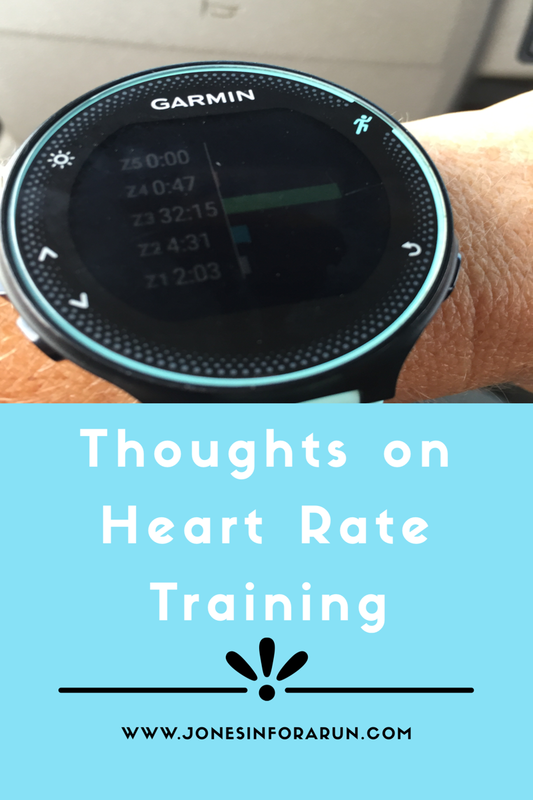 I also read some posts from Another Mother Runner about their experiences with heart rate training and it sounded kind of interesting. That being said that was enough for me to download the Marathon Training Heart Rate plan from the Garmin Connect website and give it go! So here is the heart-rate training for dummies summary of what I am doing in order to get ready for the Richmond Marathon in November. First off I am doing three basic runs. The first is a slow easy run- when I say slow, easy run I mean very slow and very easy. I am supposed to keep this run in my zone 2 heart rate. This is actually hard for me because zone 3 is my sweet spot. I feel like I could run forever in zone 3, so in zone 2 I really have to slow down and take walk breaks to keep my heart rate at the correct level. The second run that I do is the threshold run. This one is where speed comes into play. Each week the amount of time of running at the threshold pace increases. This is where I really have to focus and push through the pain because running fast is hard for me as well. This is not a very long run so I really have to keep telling myself it is short bursts of work then I get to recover (if you can consider 20 seconds recovery). The third type of run that I do on this plan is the long run. The cool part about the long run is that there is no distance expectations to make this a mental game. For the long run we simply set out for a ten minute walk, then an easy 25 minute run in zone 2. Each week the walk portion gets cut shorter and then slow run increases which translates into longer mileage each week. The long run has been the hardest for me to get used to. During my last marathon training cycle I had a beautiful calendar that said exactly how many miles I should run during each long run to eventually work myself up to that glorious 20-miler. I know everyone says “trust the process” but at time this can be hard. So if you try to balance out the pros and cons I am pretty neutral about this whole adventure. I enjoy the laid back pace the general plan but wish I had more of a mileage goal for the long runs. Have you ever tried heart rate based training for a race? I would love to hear any tips, tricks or suggestions! Interesting!! I know my friend – who is a new runner and was constantly exhausted from her runs because she pushed herself to much (both in speed and mileage) started running according to her heart rate and it made her a much better runner, because her endurance went way up. I have Garmin 235 coming to me soon, so I am excited to try it out. I always trained according to my feeling of “comfort”, but never by my heart rate. That should be interesting. Thanks for your thoughts. I don’t think I have the patience for this!